In order to work out the energy efficiency of a heat pump, you need to accurately find each units “Energy Efficiency Rating” (EER) for cooling and “Coefficient Of Performance” (COP) for heating. These figures will be published by the manufacturers. In recent years there have been a number of changes to the star rating system which has caused much confusion. The reason for this is an increase in environmental awareness, meaning that many older model heat pumps’ energy ratings are no longer correct and manufacturers are constantly introducing new more energy efficient models. 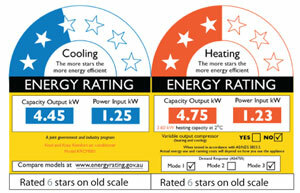 Manufacturers are required to display star rating labels on their heat pumps on sale in New Zealand. But the confusion doesn’t always stop there because how do you know how many stars you need or how much a difference of ½ or 1 star will save you in running costs? The easiest way to ensure you get a very efficient heat pump is to choose one that bears the blue “Energy Star” logo. Simply put, the more efficient a heat pump is, the more stars are displayed and the cheaper it will be to run. In New Zealand, heat pumps must comply with a set of regulations in order to be sold. These regulations are called the Minimum Energy Performance Standards (MEPS) and set out, among other things, how to test the heat pumps’ performance and how to display that performance. This encompasses the energy rating star label system. In order to receive the blue Energy Star label, manufacturers of heat pump products sold in New Zealand have had to register as a New Zealand Energy Star partner and have had to conduct various tests on their products and meet specific criteria. This is an international energy-rating symbol used to identify the most energy-efficient products and is the benchmark for efficient energy performance. Only the best of the best heat pumps (the top 25% of performers in each size) can achieve this award.